No fire or no panic. Do not come to wrong conclusions by looking at this photograph below. 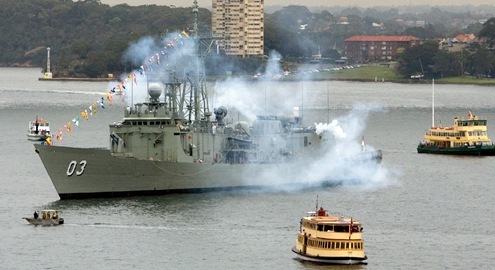 In the above photograph, HMAS SYDNEY (FFG03) gives a 21 Gun salute on March 13 at Sydney Harbour for the Royal Australian Navy’s Fleet Review 2009. The Fleet Review is considered as the largest show of naval force in 20 years. The Governor of New South Wales, Her Excellency Professor Marie Bashir AC CVO, was the guest of honour, inspecting the Fleet from onboard the Admiral’s Barge along with Commander Australian Fleet, Rear Admiral Nigel Coates, AM, RAN. visiting New Zealand ship HMNZS Canterbury. All the seventeen ships were on Sydney Harbour for a Fleet Review by the Governor of New South Wales, after six weeks of Navy training exercises off the east coast, as part of the 2009 Fleet Concentration Period. 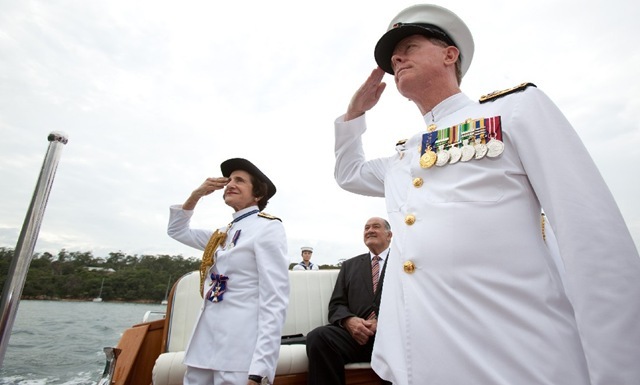 Here is a photograph of Her Excellency Professor Marie Bashir, AC, CVO, returning the salute with the Commander Australian Fleet, Rear Admiral Nigel Coates, AM, RAN, for the Royal Australian Navy’s Fleet Review 2009. Her Excellency Ms Bashir, who is an honorary Commodore in the Navy, was acknowledged with a traditional “Cheer Ship” by sailors as the Admiral’s Barge moved past each vessel. Read more from Department of Defence, Australia media release: Royal Salute on Sydney Harbour for Fleet Divisions. View more photographs of Royal Australian Navy’s Fleet Review 2009 from Department of Defence, Australia.